I first came here back in 2007 when I attended a training class in Glastonbury for work and had heard about Cromwell Creek as a local place to ride from Bikerag.com. The trails back then were overgrown and there was some rotted stuntry here and there. As mentioned earlier, the trails were a combination of foot paths and atv tracks. Just getting out and trying something new was my reason to be there but in the years that followed the Blow Hole became a center of attention for the Connecticut Chapter of New England Mountain Bike Association, in which I was associated with for 10 years and led the Chapter as President for 7. We did a lot of maintenance and trail building here over the years, and it still continues as focal point for the Central Connecticut Chapter of NEMBA. From what I could see by today's visit it was definitely paying off. My reason for being here was similar to my first visit as I was attending the 2018 CT Trails Symposium in East Hartford. I put it out to the other mountain bikers that I knew would be attending that we should ride The Blow Hole and then hit Eli Cannons for beer and fried pickles. Turns out while some people brought their bikes no one could ride after all. However, the current Central Connecticut NEMBA Chapter President, Glenn, was at the symposium and provided the intel I needed to ensure that I had a fun ride. 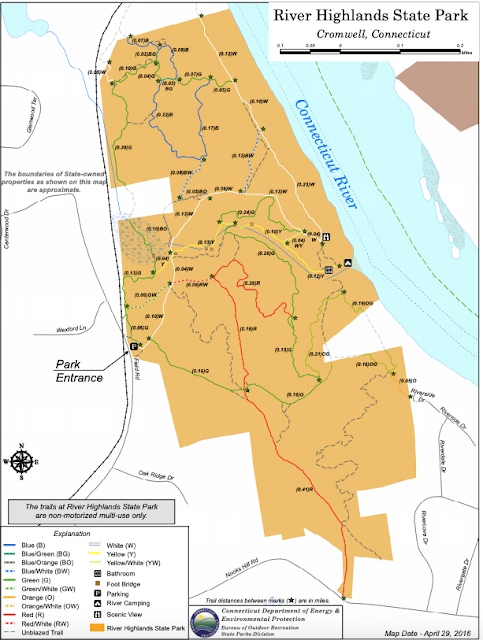 The other thing I did was down load the trail map (pictured above) and saved to my phone. That really helped me find all the trails again, especially since they are really well blazed, and Glenn told me where to find the new stuff, too. I started out from the Parking Lot headed to the Bluff but I realized as I was half way down the central trail I forgot to turn on my GPS, so I backtracked to parking lot and started over, this time with the GPS recording my route. Rather than the direct route to the Bluff, I took the singletrack route instead which started on the green/white to the white, then the yellow trail and back up the northern side of the gully to hit the single track that skirts the gully rim to the Bluff. From there I hit the hike-a-bike heading north, it was a means to an end, but it dawned on me that I usually avoid this part of the trail. Heading in on the blue trail I think I took a wrong turn and came out higher on the Sidewinder Tail than I should have but it appears as though the trail gnomes are starting to extend it so I rode the upper part, which sucked, but then I got on the actual trail and it rocked. From there I headed back over to the Blow Hole Gully and rode the rim trail (green) south. Glenn suggested that I head that way to hit some new single track that he built a few years ago. The south rim trail (green blazed) was outstanding and really well maintained. Gone were the off camber trails and replaced with properly benched single track with rolling grade dips and some little challenges here and there that really make riding this trail fun. I headed further south along the bluff until I came across some of the new single track that Glenn had told me about. While flat, it was flowy and had some fun skinnies to ride along the way. Then I found the new trail that he was working on called Brown Sugar and it was incredible. Super fast and flowy. Coming back to the lot I met up with Glenn, who by the way, was going to meet me at Eli's. He pointed out some new stuff that he thought I might have missed so I went out for seconds. Towards the end of the ride it was getting chilly and I was riding in shorts. It didn't feel that cold. We need this sign at Upper Paugussett and Waldo! Men are from Märszen which was a cloudy Oktoberfest style beer. And of course, fried pickles! How was that beer. Almost ordered it the other day. I missed the fried pickles. Beer was pretty good. I was expecting a little more of that malty, Oktoberfest flavor which there was just a hint of.